What can be the reason for “Invalid module format”? And I've also configured grub.conf correctly. Module and kernel are not the same version OR, some times, you can get this error if you didn't used the same compiler for modules and kernel. In your case, you recompiled the kernel and you didn't change/rebuild initrd. The screenshot what you posted now, show us a bad initrd with old modules. You should reboot with the old kernel (if you didn't overwrite it) and rebuild initrd also. Check dmesg, there should be a better message which states why the loading failed. Not the answer you're looking for? Browse other questions tagged linux-kernel kernel-panic kernel-modules or ask your own question. 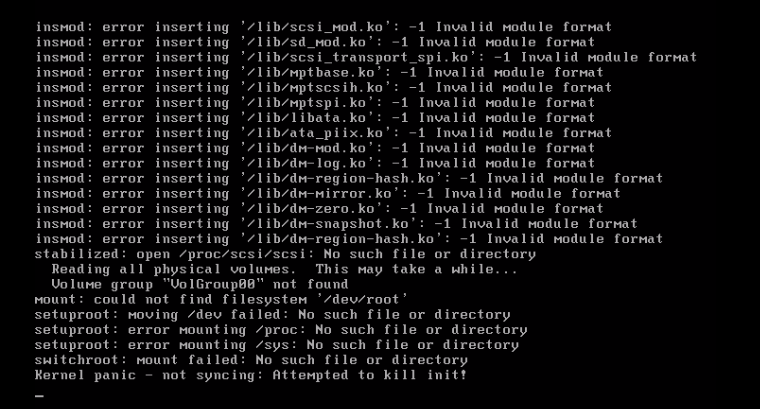 Compiling linux kernel - `make install` asks for LILO. Now what?